When I started this hobby I was testing out what I liked I ran across many wet shavers using Clubman products. I was already using the aftershaves but never venture to anything else. Then along came the holidays and Clubman sent out an email blast with an offer I could not refuse. So I picked up a couple of things Shaving Cream, Shaving Soap even pomade all kinds of goodies. The shaving cream disappointed me so much that I left all the other products I purchased on the den shelf where I promised I would go back to them another day but that was two years ago. 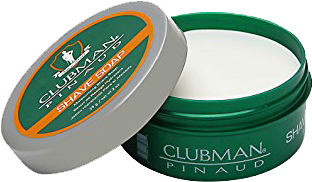 I recently revisit these products last week so the first one I will talk about today is the Clubman Pinaud Shaving Soap. I had forgotten how surprised I was to find out the size of the container. Since it was such a long time ago I can’t recall what I paid for it but I’m glad it was on sale I would have been pissed if I paid full price for it. I’ve seen this go for $10.00 to about $5.00 so look out for the cheapest way to get yours because it’s only 2.oz some report it as 2.4oz. I’d like to know what makes this mass produced shaving soap in a plastic tub so expensive? The scent is nice but very faint I find no trace of any information regarding what the notes are not even on the Clubman website. I heard they had vanilla listed at one point but now that has been taken down. In fact, some categorized it as a masculine scent but I’m not so sure about that. I have visited this site before and it's full of errors and omissions. Maybe they need to do a once over because I’ve called them in the past with a few things I've found wrong. If you do have this product let me know what you think it’s scent is. When it comes to lathering this soap does a great job. My bowl lather produced an amazing amount of it too. The lather got right into the beard providing some great coverage with a nice rich creamy lather. The slickness and glide where tops allowing me to go over trouble spots with no irritation at all. Although I did spot a nick after looking into the mirror I can’t really blame the soap because as I talk and shave this is what happens. I’ve been noticing if I keep silent this usually solves the problem but it's hard to do when you need to comment on the shave for your YouTube Channel. Product: Shaving Pinaud Shaving Soap $5.00 - $10.00 check online for the lowest price.